Walton De-icing systems will be supplied with an automatic Rain/Snow sensor – controller unit (DS-4) integrated into the Power Distribution Panel unless the controls are upgraded to the ADC-2000/3000 Antenna De-ice Control System. The DS-4, when coupled with the DP-7EX Remote Control/Status display panel, provides the user with a versatile, yet inexpensive method of controlling the de-icing system. The Local Control/Sensor units along with the Power Distribution Panels are designed specifically to operate in high noise, low temperature environments, for added reliability. The DS-4 Automatic local Control Unit operates by detecting temperature through a thermistor and precipitation using a moisture sensor. These signals are then supplied to the microcontroller, which willactivate your de-icing system. 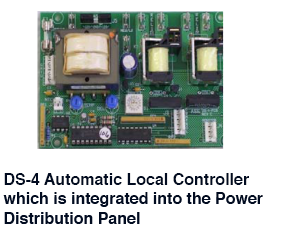 The DS-4 Controller can be powered by either 110-120 VAC or 200-240 VAC 50/60 Hz power. The DP-7EX is mounted on a 1.75” X 19” standard, single rack mount panel. The black powder finish assures high indicator visibility, even from a long distance. Termination of the cabling from the local unit is easily made through the rear mounted terminal blocks on the back of the unit. All connections to the unit are clearly marked on the rear of the panel to simplify installation. A de-pluggable terminal block for interface also makes swap-out a snap. Control Leads going to the DS-4 Local Control/Sensor are optoisolated in order to improve noise immunity, reduce ground loop problems, and provide circuit protection. This also allows the DP-7EX to be mounted up to 1200 feet away from the Local (DS-4) Control/Sensor. Dry contact I/O for customer monitor and control equipment is also provided for monitoring the status of the deicing system along with allowing full remote Manual On activation, no matter what position the DP-7EX control Switch is in. A panel indicator will show a remote M&C Manual On command. The DP-7EX remote control/status display panels coupled with the DS-4 provides a low cost method to remotely monitor and control your De-icing System The DP-7EX provides basic De-ice on Status for the de-icing system, along with Manual on, Automatic, and Standby control capabilities. The DP-7EX also allows monitoring thermal switches, on up to eight antenna points, to confirm that heat is being applied where required.